The fall of the market garden. “Can you go down to The Grundey’s on your bike, here is some money”. This conversation does not happen now, the Grundey’s of the past don’t exist any longer, the market gardens and the Smallholding’s have gone. We supplied salads (Tomatoes,Lettuce, Cucumbers, Beetroot, Onions etc. ), Beans, Soft fruit, Mushrooms, Cut flowers, Eggs and Pigs that were slaughtered locally. Every village had its smallholding or market garden usually run by a family. Even small towns had several Market Garden’s operating. The use of cheap fuel to deliver to supermarkets, very cheap food, world wide food corporations, peoples expectations of eating none seasonal food and legislation made the market Garden’s and Smallholding’s no longer viable. Children don’t cycle out on errands now to buy local food. 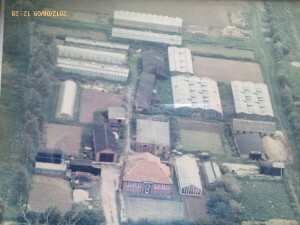 My Parents only moved from this smallholding 15 years ago after 30 years. The site now has an extended house and horses on the 4.5 acres. The site now is a consumer not a producer of food and resources.